A lone wolf, a wolf family, three coyotes, and a grizzly bear taught me an important lesson on the power of pack last week. Perhaps you’d like to share in the excitement? Before I continue, I should warn you that all of the closeup photos in this post are from a different place and time. I was so riveted by the action (and the characters were so far away) that I couldn’t take my eye off the scope long enough to pull out the camera. So, please consider the photos here more an imagination boost than anything else. 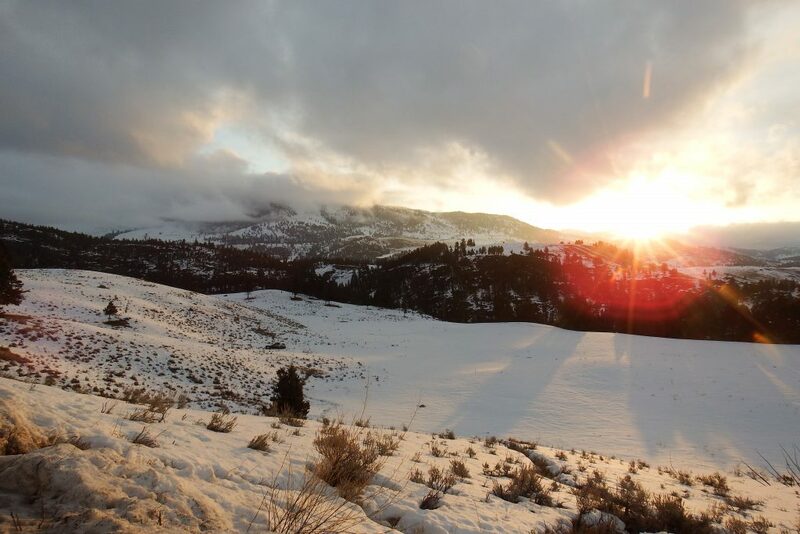 That caveat aside, my story starts at dawn in the North Range of Yellowstone. A bit to the right of the sun in the photo above, the Junction Butte pack was hanging out around a bull elk carcass that they’d taken during the night. The eleven-month-old pups were playing. The adults were sleeping. 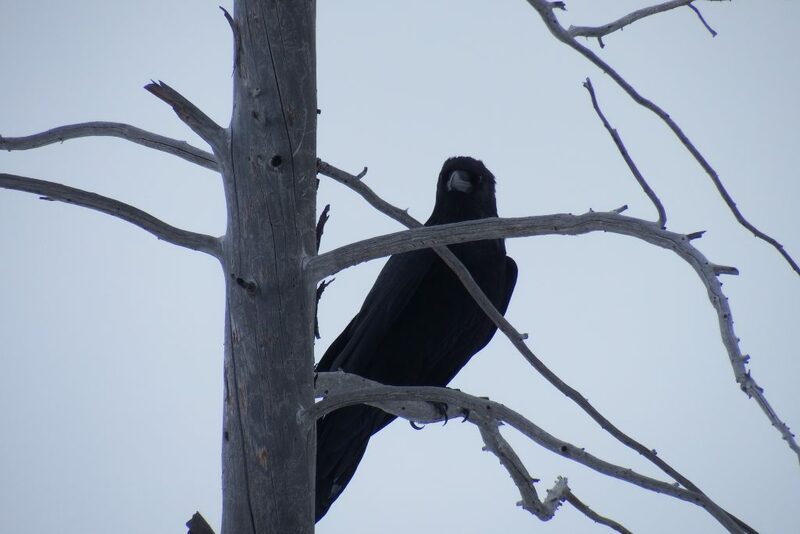 Ravens were sneaking in to steal bites. And, at various spots along the road, wolf watchers had set up their scopes to watch the action unfold. There wasn’t much action though, once you got over the cuteness of the pup play. So, when we heard coyotes yipping perhaps halfway between us and the kill site, many folks moved our scopes over to Yancey’s Hole to check out the wolves’ smaller relatives. Coyotes, as you may or may not know, have a social structure a bit like that of wolves…but different. Weighing in at a third the mass of wolves, coyotes go for small prey and generally hunt solo. They do defend territories from other coyotes, and they do bed down together once hunting time is done. But even the full pack is usually just a handful of animals — a mated pair plus maybe a few youngsters from last year. The books tell me that a wolf is always the winner in a coyote-wolf interaction. 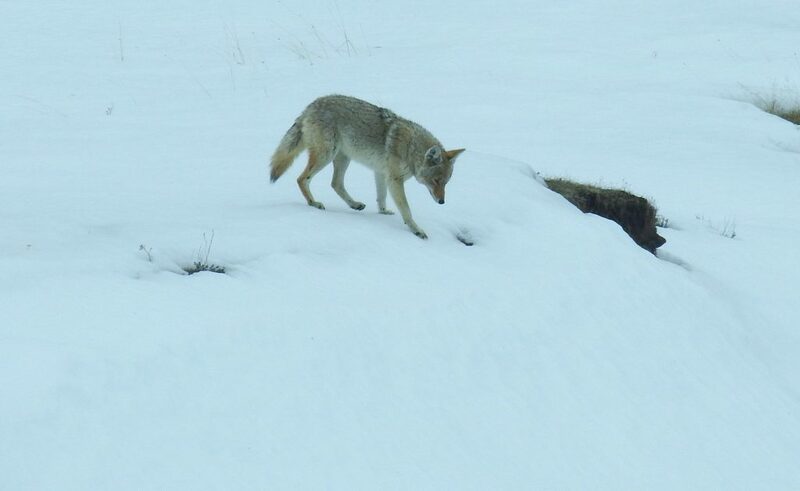 That’s why, soon after wolf reintroduction to Yellowstone, coyote numbers declined dramatically (and fox numbers actually went up since coyotes, in turn, kill their own smaller relation). What the books don’t say is that a pack trumps a lone animal any day of the week. 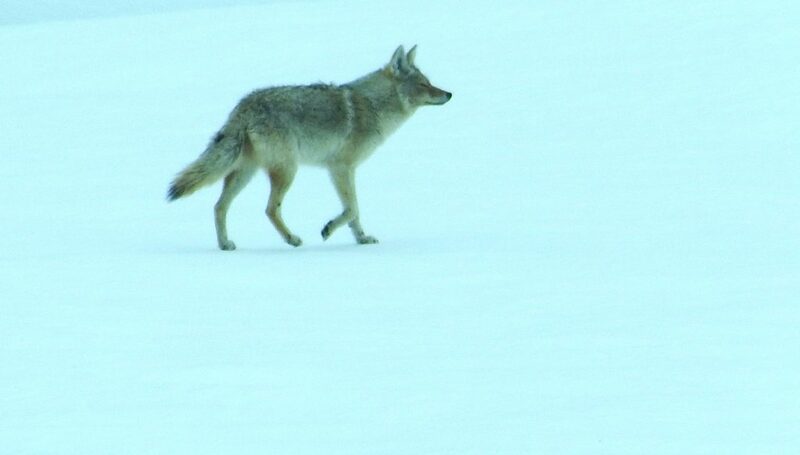 In this case, the wolf initially looked like it might be able to wander through coyote territory unscathed. 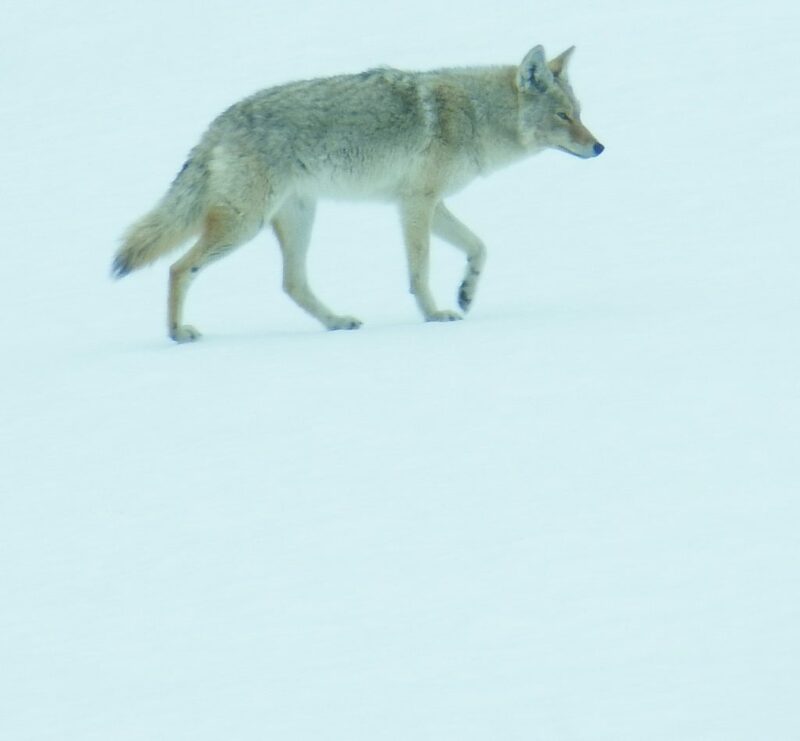 But it was three against one, and before we knew it the coyotes were driving their larger relative up off the ice and into the snow. The story became more poignant when our guide clued us in to the lone wolf’s likely identity. 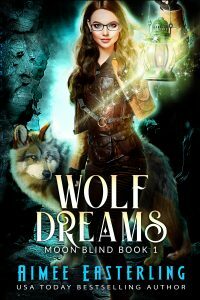 Leo Leckie knows each wolf in the park by number and ancestry and can tell you in great detail about the soap-opera drama of mating, fighting, and hunting in which the packs engage. In this case, Leo had two guesses about the uncollared lone wolf’s identity. 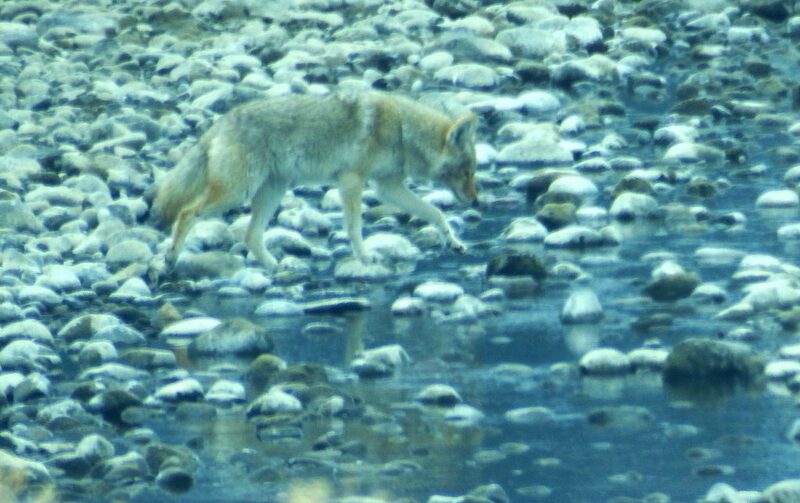 The most likely scenario, he told us, is that this was a youngster who used to be part of the Crevice Creek Pack before said grouping splintered and failed. It all began when yet another pack lost their alpha male to a hunter outside the park boundaries, leaving the females without their patriarch. 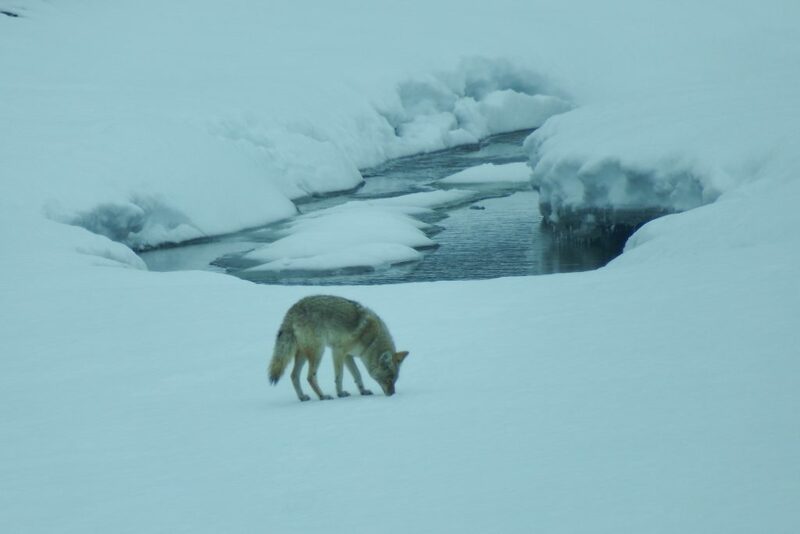 Their hunt for a solution was as bloody as the initial problem — they drove the alpha female out of the Crevice Lake Pack and stole her males, leaving this pup alone in the cold. Life is tough for a lone wolf, as I soon discovered. 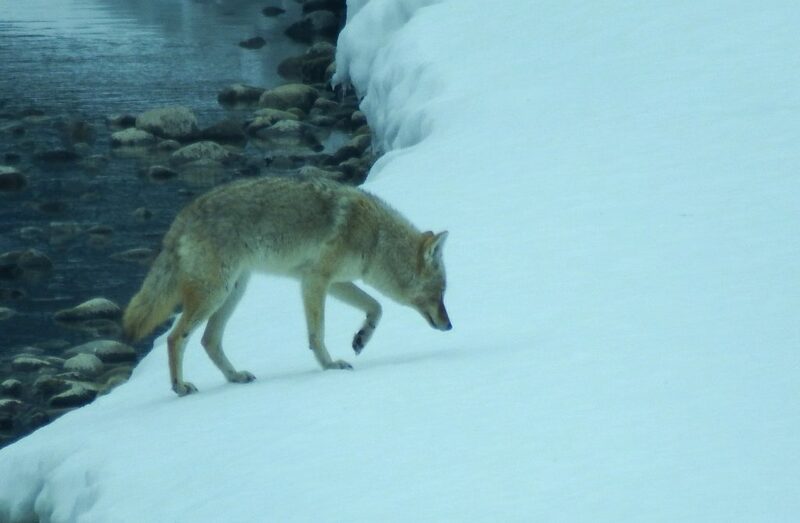 But he was lucky to run into coyotes — less bloodthirsty — rather into than another wolf. In this case, the smaller canines just got the wolf’s attention, then they escorted him out of their territory in one long line running along the top of a hill. 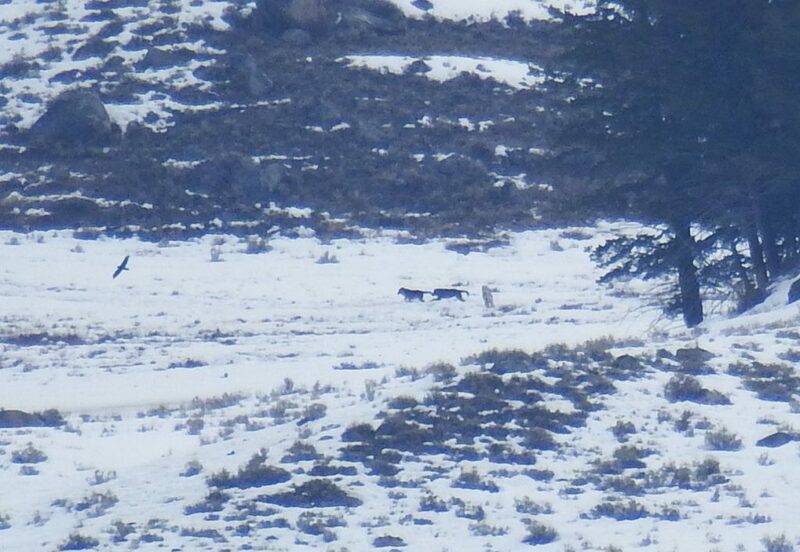 First came a coyote, then the wolf in the middle, then two more coyotes bringing up the rear. 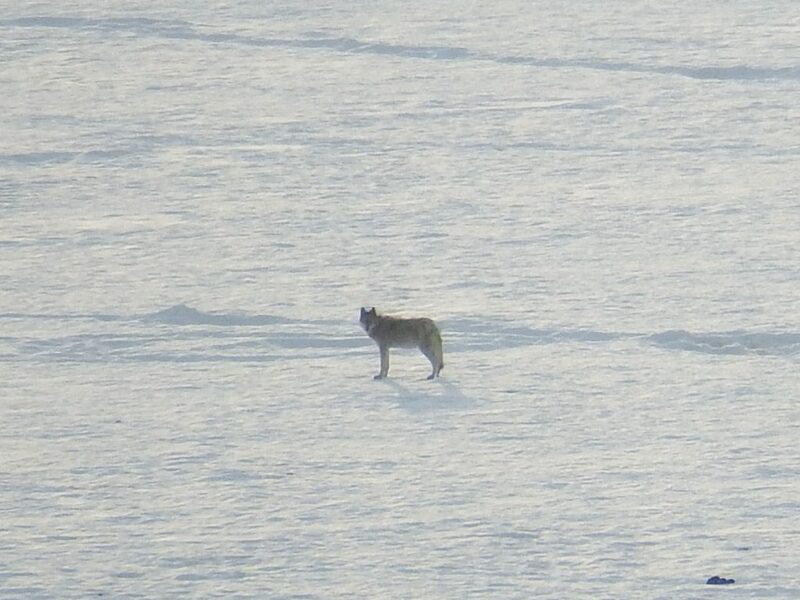 As a unit, every one of the wolf watchers whipped our optics back up to the more distant carcass site, leaving that lone pup to escape on his own. Because grizzlies were just coming out of hibernation, so seeing one at that time of year was considerably rarer than a wolf sighting. But sure enough, there the bear was, lumbering toward the site of the bull-elk kill. Now, once again, let me start with book learning. Grizzly bears are tremendous compared to a wolf, so it’s no surprise that they steal wolf kills left and right. In fact, some naturalists have reported that grizzlies follow the scent of wolves, looking for a dinner to steal rather than taking down their own prey. I fully expected the Junction Butte pack to lose their dinner and have to move on. But this post, as you may recall, is about the power of the pack. Five or six wolves were on that bear by the time I got my scope refocused. They mobbed the larger animal, jumping and biting…and within seconds it was the grizzly rather than the wolves who headed away. And, okay, so the grizzly didn’t run scared like the lone pup had in the face of coyotes. Instead, the bear ambled, a bit like my cat when I shoo him off the counter. “I didn’t want that carcass anyway,” I could almost hear the grizzly say. 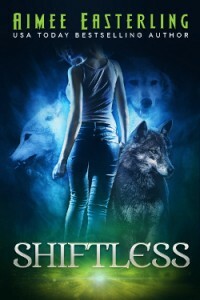 But the wolves did want the carcass…and they kept it. And that, many scientists suspect, is why wolves live in packs.